The use of PVC for building and many other applications has raised huge amounts of controversy. There has been a variety of reports, none of which seem to be able to conclusively answer the question of the true environmental impact of PVC. Many environmental organisations have campaigned against PVC at times in the last decade or more. Polyvinyl Chloride is an organochlorine compound, and as such is responsible for emissions to the environment during manufacture and disposal of extremely toxic and highly persistent organochlorine compounds – furans and dioxins. Greenpeace ran a concerted campaign against the use of PVC in the construction industry in the late 1990s. At the 2000 Sydney Olympics the Stadium was built entirely without PVC for environmental reasons, and of course the UK Government bowed to environmental pressure and removed PVC from the Millenium Dome roof. A number of countries have at various times adopted policies to restrict or phase out the use of PVC in construction. Over 50% of all PVC manufactured is used in construction, in products such as windows, pipelines, wiring, flooring and wallpaper. There is an extremely heated, and often very badly informed, debate within the glazing industry about the use of PVC versus alternatives such as timber. Recently many people were surprised to see the BRE Green Guide to Specification move PVC from a C rating to an A rating. At Green Building Store we take the view that where alternatives are available, particularly where they can offer other advantages over PVC, then if for no other reason than the precautionary principle, then these should be encouraged. A Greenpeace report (“Look Out – Your choice of window could seriously harm the planet”) argues that “As long as timber is sourced from properly managed forests and care is taken in the choice of preservatives, paints and stains, timber windows are by far the best environmental choice”. 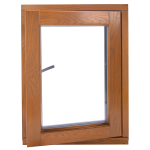 Green Building Store supplies a range of timber windows and doors.